If you play the guitar, why not make a personalised strap that's as individual as your tunes? You can make the guitar strap as basic or professional-looking as you like. Here’s a basic tutorial to get you going. 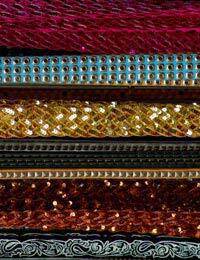 The fabric that you choose for your guitar strap needs to be strong enough to hold the weight of your guitar. First of all you’ll need to know the measurements for your guitar strap. One way to find this out is by holding your guitar at the lowest point that you would want to hold it. Then, get a friend to help you measure the distance round your neck from one guitar peg to the other. You could also just measure an existing guitar strap. Decide how wide you want your guitar strap to be. You need to decide what you want the finished width to be and then double this to get your actual measurement for cutting out. Don’t forget to add half an inch all over for the seam allowance. You can then cut it out. Why not decorate your guitar strap with your name or your band’s name? You could also cover it with lyrics from your band or other slogans that inspire you. You could also decorate it with things such as buttons, badges and symbols. The only real limit is your imagination. Fold your guitar strap wrong sides together. As you sew down the seam, fold the edges in as you go so that they are caught under the stitch. You’ll need to punch holes in your strap so that you can attach it securely to the guitar. Make a mark one inch from each end of the strap. Use a hole punch to make a round-shaped-dent on either side of the strap – you’ll use this as a guide to cut the holes out. You can add a few holes if you want the strap to be adjustable. The strap is now ready to attach. Remember that thicker guitar straps will be most comfortable on your shoulder. However, consider how you like to move around with your guitar as a strap that’s too wide could restrict this. Choosing as sturdy a fabric as possible will make your strap last longer. You may choose to add some padding near the shoulder of your guitar strap for comfort. Make sure you are careful to make sure that the guitar strap is the right length for you. Making it too short would make playing awkward. If your fabric is not long enough for the strap, just attach extra fabric at one or both ends to extend it.